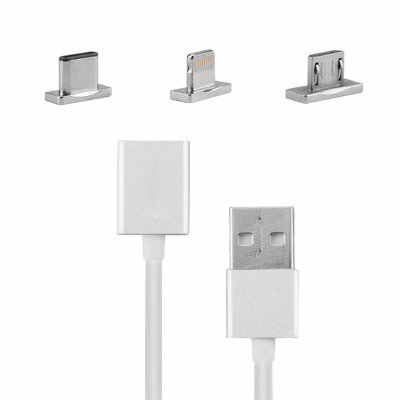 Successfully Added 3 In 1 Magnetic USB Cable - Charging + Data Sync, 8 Pin, Micro USB, Type C USB, iPhones, Tablet PCs, Laptops, Android Devices to your Shopping Cart. One cable to unite all your devices. No need to carry multiple cables for phones, power banks, music players or other devices. This 3 in 1 cable is the all in one portable charging solution for those who are constantly on the go. This multifunctional 3 in 1 cable is the perfect accessory for all your gadgets. With a magnetic socket, you can swap one end of this USB cable to be compatible with 8 pin Apple style connectors, micro USB or type C USB devices so it can work with most phones. The 3 detachable magnetic ends offer great versatility and can be stored together with the lead or kept inside your phone or devices, so it's always ready to use with the USB lead whenever you need. Suitable for use with iPhones, Tablets, Laptops, Android devices and countless peripherals this mini USB cable makes charging and transferring data quick and effortless. Why carry 3 cables when just 1 is enough. This 3 in 1 USB cable comes with a 12 months warranty, brought to you by the leader in electronic devices as well as wholesale electronic gadgets and accessories..